If you are missing one or more teeth, Dr. Stephen D. Lipman can place a dental bridge to improve the appearance of your smile. Bridges can also keep surrounding teeth from shifting to preserve your overall oral health. Dr. Lipman has years of experience and uses advanced materials and techniques to place dental bridges at our Windsor, CT, office. A dental bridge is a type of restoration used to fill in the gaps caused by missing teeth. A traditional dental bridge is comprised of an artificial tooth or teeth secured by dental crowns on either end. An implant-supported bridge is anchored to dental implants which are small metal posts secured in the jaw. Dr. Lipman offers removable and fixed bridges, as well as bonded bridges. 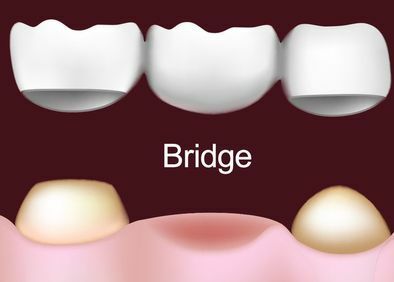 This type of bridge is secured by wings on either side of the restoration and does not require the same amount of modification to surrounding teeth as a traditional bridge. If you are missing one to three consecutive teeth, you may be a candidate for a dental bridge. If you opt for a traditional bridge, the adjacent teeth must be structurally sound in addition to being free from dental decay. If you have gum disease, Dr. Lipman may recommend treating the condition before proceeding with a bridge. Only patients who are good candidates for dental implants can receive implant-supported dental bridges. Dental implant candidates need to have adequate bone structure at the implant site. They also need to be free from periodontal disease, have good oral and overall health, and not smoke. If a patient does not have adequate bone volume or density, he or she may be a candidate for a bone graft or a sinus lift to build up and strengthen the treatment area. Dr. Lipman will consider your particular needs when determining which type of bridge you should receive. If you choose a traditional bridge, Dr. Lipman will prepare your surrounding teeth to accommodate the dental crowns. Next, he will take an impression of the area and send the information to a dental lab. Since the fabrication process takes roughly two weeks, Dr. Lipman will place a temporary bridge to act as a placeholder and protect your reshaped teeth. When the bridge is completed, you will return to our office to have the permanent bridge anchored in place. Whether you choose a traditional bridge or an implant-supported bridge, this type of restoration can greatly enhance your appearance by replacing missing teeth. Implant-supported bridges are also an option for many patients. The patient will first need to undergo implant surgery and then wait four to six months to allow the posts to fuse with the bone. Once the patient is fully recovered, Dr. Lipman will use abutment pieces to attach the custom-made bridge to the implants. Whether you choose a traditional bridge or an implant-supported bridge, this type of restoration can greatly enhance your appearance by replacing missing teeth as well as maintaining a youthful facial structure. With a bridge, you may be able to chew more easily, especially if several teeth were missing. Bridges can also correct speech issues due to missing teeth. A main benefit of implant-supported bridges is that dental implants prevent jawbone deterioration by replicating the function of tooth roots. Implant-supported bridges are often preferred by patients since they are more stable and secure than traditional bridges. However, implant-supported restorations not only require a more lengthy treatment time, but are also more expensive. Missing teeth can substantially impact your quality of life. If you suffer from tooth loss and would like to learn more about your options, contact our office today and schedule a consultation with Dr. Lipman.